If you hold on too long, someone’s going to put a bullet in your head. Another Eric Paice teleplay, and an improvement over The Decapod although, where that had a decent twist, the whos, whys and whats of Bullseye lead to something of a shrug. Its greatest asset is Ronald Radd’s stock market tycoon Henry Cade, a Gordon Gekko a quarter of a century before Wall Street, revelling in buying up, stripping down and selling on his assets without conscience or regard for those who may lose out. Cathy: I feel if I hold on a little longer someone’s going to go up to three pounds. Young: If you hold on too long, someone’s going to put a bullet in your head. 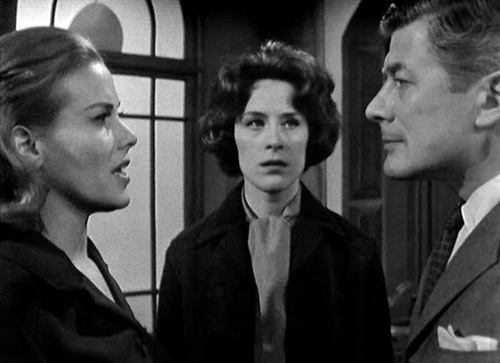 Cathy’s back in the frame, and front-and-centre, similarly to Venus in the previous episode. Unlike Venus, though, she has sass and smarts on her side. 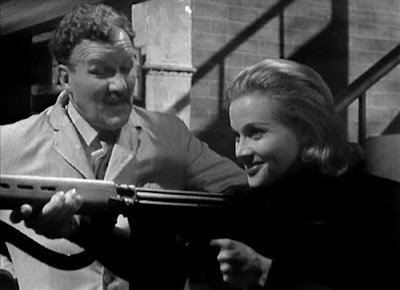 Steed ensures a sizeable portion of shares in suspicious gun manufacturer Anderson’s Small Arms are purchased when Mr Anderson is discovered with a bullet in him (the first of a string; board members start dropping like flies), and all it takes is for Cathy to appear at the shareholders meeting, ask a few diligent questions, and presto, she’s taken his place. Perhaps surprisingly, the portrait of the pressures of share dealing and Cade’s attempted takeover are far more engaging than the arms dealing side. Which is a bit of a murk of Anderson arms being smuggled to Africa under the watch of Karl (Bernard Kay). 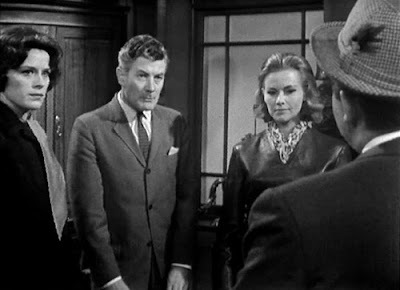 There are shenanigans too; Karl is carrying on with Dorothy Young (Laurie Leigh) in front of her director husband (Felix Deebank), who is attempting to carry on with his secretary Jean (Mitzi Rogers); he manages to get her back to his house boat at any rate, in an example of some very dodgy '60s office dirty doggedness. Karl’s interests are purely those of leverage, however, as he’s also been carrying on with Doreen Ellis (Judy Parfitt). Quite how Karl came to gain such a hold over the company and its staff eluded me, and his demise is similarly perfunctory and insubstantial; he heads off for Brittany with Dorothy and we are told the river police caught up with the boat and recovered the guns. Cathy: How would you describe your taste in décor? 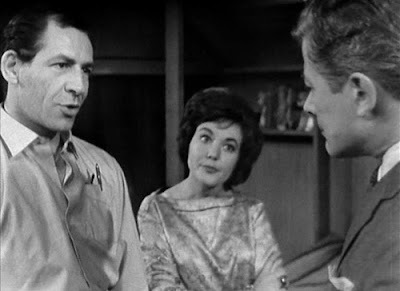 Cathy: I see you are a frank and straightforward man. Cade: No, I’m cunning and devious. Radd was only 33 when he made this, but he could easily pass for the 44 he’s playing as Cade. 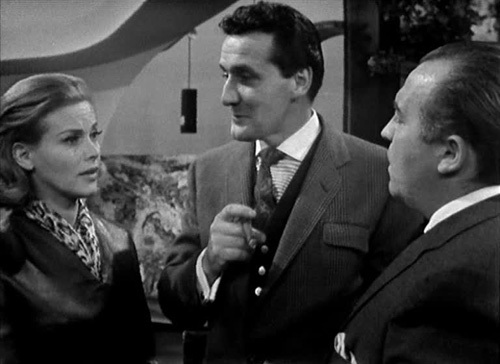 It’s amusing to see the positive impression he makes on Cathy, and particularly the way Steed overtly disapproves (“You don’t want to get mixed up with the likes of him”). 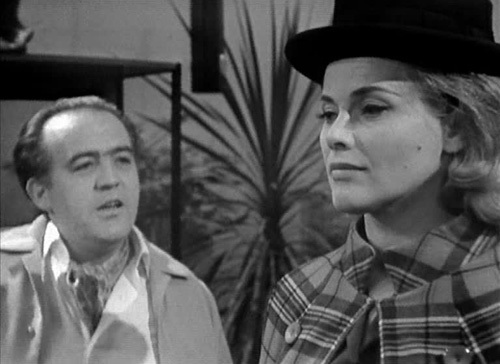 Indeed, the episode ends with Cathy and Cade agreeing to a dinner date. 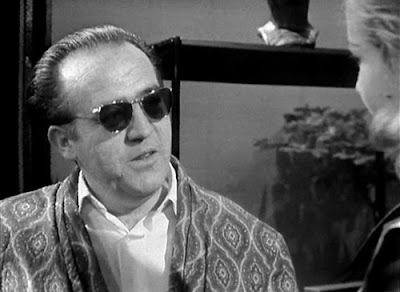 While Cade, presumably an ex-pat since he has a home in the Bahamas, is unapologetic about his behaviour, he’s also winningly transparent, describing his typical actions upon taking over a business (first he pays off directors, then fires all the executive staff, then brings in an accountant to go through books for irregularities) and pointing out that Anderson has no moral high ground to stand on (three co-directors devoting their lives to making armaments, and each finding a bribe too big to refuse; which got them bumped off). Appropriately, Cade is instrumental in tying up the case; Cathy sells her shares to him, enabling the takeover and thus putting a halt to Karl’s activities. To add insult to the company’s injury, Cade wastes no time in disposing of his purchase, selling it to a Japanese syndicate (questioned why he didn’t examine their files down to the last paperclip, he replies, “Well, I always say that, it frightens them you see”). Steed: Fascinating place. Oh, they’re so greedy! Of course, Cathy has reason to see the positive side of Cade (she thinks he puts on a show, and it may be that he’s less unscrupulous than he likes to make out), as Steed hasn’t exactly been doing everything in his power to win her favour. He has been entering her flat, posing as a window cleaner and telling the police she’s gone to the Isle of Wight when they show up at the door. He also arranges for her to meet Young on his houseboat. “Did you conduct any more of my private business while I was out?” she asks. His reaction to the sights of the stock exchange is similarly Steed-ish, although the proceedings are generally Steed-lite (“A shrewd man, your broker” Cade surmises of him when they finally meet). Generally, not a great episode, but one with a great guest character (although, foreman George (Robin Wentworth) also raises a smile, commenting that his wife wouldn’t believe the truth, that he was stocktaking late into the night, so he may as well tell her a lie).